Hello there! 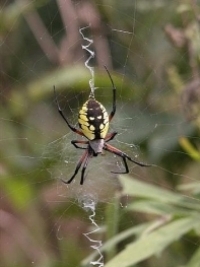 I am a friendly Black and Yellow Garden Spider. You can find me near gardens, fields and along trails! I love sunny areas amongst shrubbery, flowers, and other tall plants. I may look dangerous to people but that is just because of my coloration and size. I do not bite people unless I feel threatened. So if you respect me and my web, I’ll respect you and your backpack! I am part of the Orb Weaver family so therefore I construct my web in a circular fashion and I like to add some zigzags to the design for extra flare as well as to help conceal my presence to all my prey! It is a lot of hard work to maintain my web but someone has got to do it. Each night I consume my web and start over for the next day to make sure that it stays strong, as well as munching on microscopic insects and organic matter that keeps me healthy. I like small flying insects like aphids, flies, grasshoppers, bees and wasps. Once I feel a vibration I scurry across as fast as possible to trap my next meal. A few animals that I need to watch out for are birds and wasps. The Mud Wasp actually toys with me when they land on my web. When I think that I have a tasty treat coming my way, the wasp attacks and paralyzes. The wasp does this to feed their young live food.